According to a 2015 World Bank report, Nepal would need one billion bricks to reconstruct 650,000 buildings damagedby the massive earthquake in April lastyear. For the purpose of reconstruction, the brick production in Nepal in 2016 alone will increase by 1.5 times from what it was last year. But a substantial number of kilns have been damaged in the quake. Most of these were coal-fired and based on highly pollut¬ing old technologies. The owners now have the opportunity to adopt cleaner technolo¬gies. The production of one billion bricks with older technology kilns would emit 39,000 tonnes of carbon dioxide, estimates the report. Here lies the challenge for the government of Nepal: to rebuild the coun¬try without causing severe pollution. In Kathmandu, for instance, 108 of the 112 kilns were destroyed, says the Federation of Nepal Brick Industry (FNBI). Kathmandu-based International Centre for Integrated Mountain Development (ICIMOD) says that over 350 kilns across the country were damaged in the quake, leading to a 30-40 per cent fall in brick production. Kiln owners can now upgrade to newer technologies that also promise better quality bricks and more profits. One such technology is the brainchild of icimod. 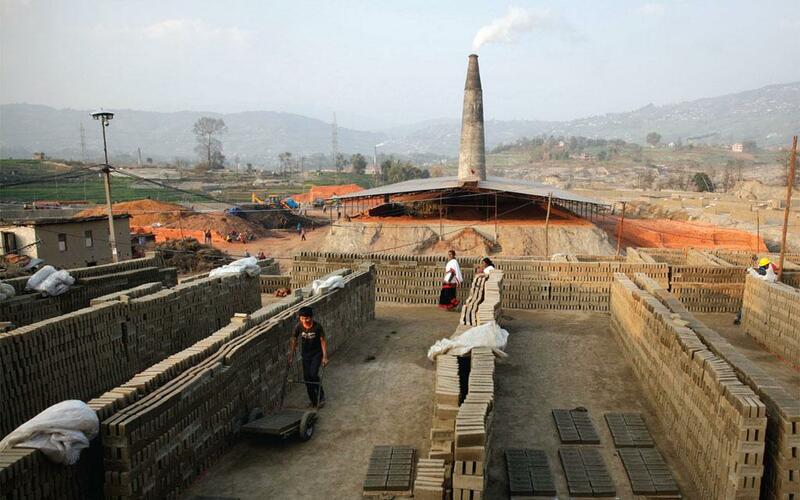 In 2012, icimod and the Nepal government joined hands with kiln ownersand started a clean brick kiln project. The project brought together experts and kiln manufacturers for the first time, claims Bidya Banmali Pradhan of icimod. The aim was to introduce a cost-effective technology to control emissions. Pradhan says that the basic guiding principle of all kiln technology is optimum utilisation of heat in the kiln’s oven. icimod developed a new technology called natural draft zig zag and forced draft zig zag. This technology adds a fan in the oven and calculates the exact air flow needed to burn coal. It also reinforces the chimney to control heat loss. “This ensures optimum heat generation and uniform baking of bricks,” says Pradhan. After the manufacturing process is over, the bricks are segregated into three categories of A, B and C. ‘A’ is the best qual¬ity and is sold at Nepalese Rupees (NPR) 15 per brick, B fetches NPR 12 and C gets NPR 8-10 (1 NPR equals 62 Indian paise). icimod claims that its technology ensures that 90 per cent of the bricks are of the best quality. David Molden, director general, icimod, says that the new technology reduces black carbon emissions by 85-90 per cent. Black carbon is a component of particulate mat¬ter that causes global warming. The tech¬nology also saves up to 30 per cent of coal, which is equivalent to saving 125 tonnes of coal annually in the country. According to the US Energy Inform-ation Administration, Nepal’s coal con¬sumption nearly doubled from 227,000 metric tonnes in 2002 to 496,000 metric tonnes in 2012. Of this, brick kilns con¬sumed nearly 50 per cent, according to data provided by Nepal’s department of envi¬ronment. “Normally, brick kilns contribute to 40 per cent of the air pollution in Kathmandu, leading to poor visibility and health problems in the valley,” says Jagadish Bhakti Shrestha, director gener¬al, Nepal’s environment department. According to fnbi, there are 826 registered kilns in Nepal, of which 157 are movable chimney kilns, which are highly polluting. However, only 20 per cent of kilns have adopted the icimod technology. Small kiln owners are hesitant to invest in the new technology without government incentive because it is very expensive. As per fnbi data, 60-70 per cent of all kilns in Nepal are small scale. A kiln owner has to invest over NPR 1.2-1.5 crore for adopting icimod’s technology. Rajkumar Lakhemaru, for instance, whose brick kiln in Bhaktapur was destroyed in the quake, invested NPR 1 crore to upgrade to the new technology. “The technology that I used earlier produced only 30 per cent best quality bricks. I have a stock of nearly 100,000 low-quality bricks for which there are no buyers,” he says. He is, however, hopeful that with icimod’s tech¬nology, he will be able to recover his invest¬ment in two years by producing high-qual¬ity bricks. The government is not disappointed with the low number of brick manufactur¬ers adopting the technology. “You cannot expect a change overnight. Even a few kiln owners adopting the new technology would lead to competition in the market. We are considering financial incentives for them in the long run,” says Shrestha. It has taken years of effort by the Nepalese government to persuade kiln owners to switch to clean technology. Until 2011, a majority of kilns used to run on the tradi¬tional Bull’s Trench Kiln technology and the Fixed Chimney Bull’s Trench Kiln tech¬nology that consume large amounts of coal and emit massive amounts of carbon (see ‘Carbon guzzlers’). In 2002, Kathmandu-based non-prof¬it Clean Energy Nepal conducted a study on emissions from brick kilns and found that PM10 levels increased nearly three times from 217 micrograms per cubic metre (mg/m3) during an off season (March- December) to 603 mg/m3 during the oper¬ational season (January-March) of brick kilns. After massive public protests follow¬ing the report, the government banned the Movable Chimney Bull’s Trench Kiln tech¬nology and formulated guidelines to check air pollution from kilns. These included phasing out of Movable Chimney Bull Trench Kiln within two years and a ban on kilns within a 1 km radius of schools, hospi¬tals and tourist spots. Between 2003 and 2006, the govern¬ment collected NPR 36 lakh through penal¬ty and shut down 22 brick kilns. The strin¬gent action succeeded in bringing down pollution levels to some extent. Persisting with its efforts, in 2002, the government introduced new technologies, such as Vertical Shaft Brick Kiln (vsbk). Pollution levels, meanwhile, continued to spiral as the number of kilns kept increas¬ing. Mahendra Chitrakar, president of the Federation of Nepal Brick Industries, re¬calls with a hint of anger how brick manu¬facturers became the biggest villain during 2006-08. “A new method of brick manu¬facturing, like vsbk, costs NPR 2-3 crore. No kiln owner has such a princely sum,” he says. According to Shrestha, it was only in 2011 that the polluting Movable Chimney Bull Trench Technology was completely phased out. At the dawn of a new year as Nepal prepares to make a new beginning, the government should introduce more en¬vironment-friendly technologies at afford¬able prices and also provide incentives to the kiln owners who adopt such technolo¬gies. This would go a long way in checking pollution levels in the country.